A horologist is someone who is interested in horology, the art or science of measuring time (wikipedia). 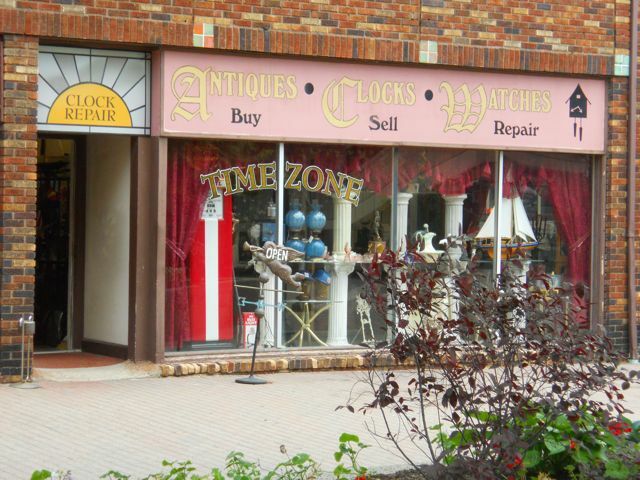 There are some horologists that specialize in clock and watch repair while others may be clockmakers. In the book, Clocks and More Clocks by Pat Hutchins, Mr. Higgins asks a clockmaker to verify that his four clocks, each on a different floor of his house, are telling the right time. He explains to the clockmaker, "My hall clock says twenty minutes past four, my attic clock says twenty-three minutes past four, my kitchen clock says twenty-five minutes past four, and my bedroom clock says twenty-six minutes past four, and I don't know which one is right." Mr. Higgins is astonished to find out from the clockmaker that all his clocks are telling correct time. 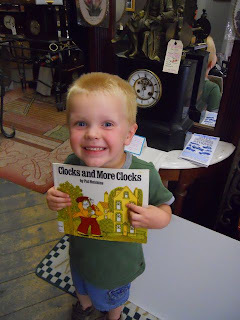 Before today, my children had never been in a clock shop and we had never heard of horology. 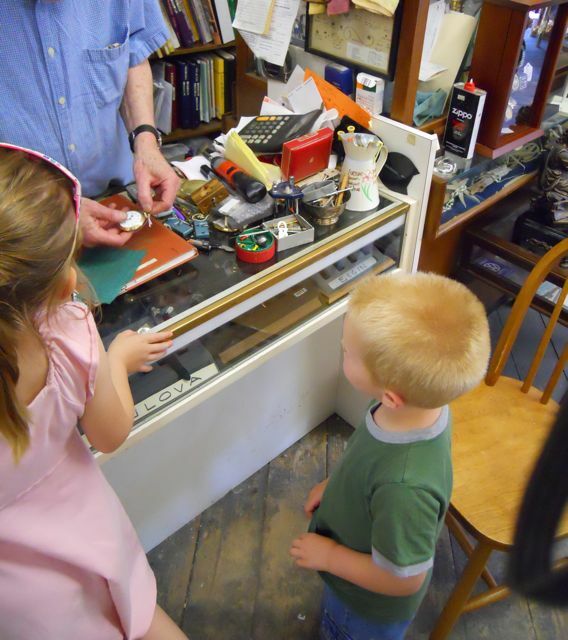 A visit to a local clock shop provided an opportunity for my children to see a pocket watch with all its moving parts, cuckoo clocks, and talk with a real horologist. Upon our arrival, I explained to the owner of the clock shop that we had just read the wonderful book by Pat Hutchins, Clocks and More Clocks. We talked with him about how we enjoyed Mr. Higgins and the experience he had with a clockmaker. 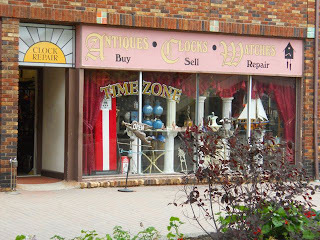 The owner said, "Now, I am not a clockmaker, just a clock repairman and a horologist." He showed my children how to set the time on an old pocket watch as well how to wind it. He said, "This watch doesn't need batteries. It needs to be wound every morning." There were so many clocks of different shapes and sizes. My son liked the clock with a statue of Benjamin Franklin. My daughter admired all the fancy colors and styles of these clocks. 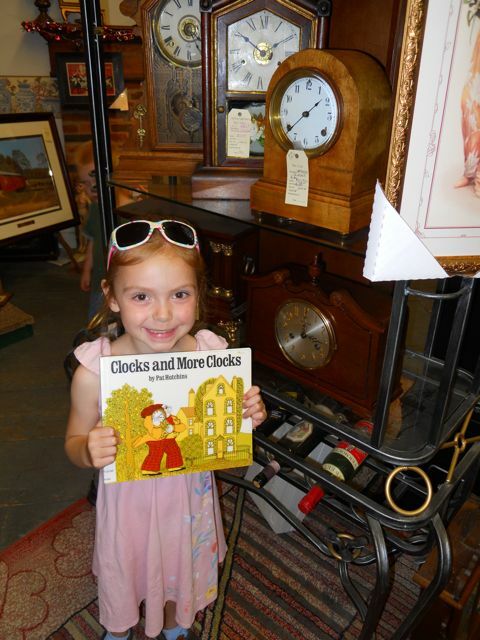 We had a great time exploring the store and appreciated the owners willingness to share stories about his clocks. They included a story about a Hickory Dickory Dock clock and his many wooden mice that he places on his many clocks. There are so many great books by Pat Hutchins including her first published, Rosie's Walk and a teacher's favorite for math lessons, The Doorbell Rang. This week we loved Good-Night Owl and My Best Friend. I admire how Pat Hutchins was able to keep the text simple in all of her books yet achieve big excitement with listeners and readers. According to Greenville Public Library, Pat Hutchins said, "The basic idea is the most difficult part, to try and do something original. When I have an idea, I sit down and work out the best way of putting the idea across in book form; then I write the story and design the layout. It is very satisfying to know it's all your own work, from the original idea to the finished artwork."